There is a good variety of alternatives to cow’s milk. This guide looks at what the options are and compares different varieties for their taste and their nutritional value. Why choose a milk substitute? Lactose free cow’s milk is available. Lactose free cow’s milk includes a lactase enzyme which breaks down the lactose into forms which people with lactose intolerance will be able to digest. Non-mammal milk, which we will look at in detail below, does not contain usually contain any lactose or casein. There are a range of milks available from nut, oat and vegetable sources which are therefore suitable for people following a vegan diet, as well as those that are intolerant to cow’s milk. 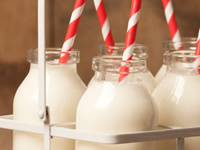 The taste of milk alternatives can vary quite significantly depending on what the milk is made from and what other ingredients are in the milk. A number of milk alternatives are fortified with vitamins and minerals which may include calcium, vitamin D and B vitamins. Soya milk is prepared from soya beans and tends to have a chalky feel in the mouth with a tofu-like aftertaste which may be stronger with unsweetened versions of soya milk. Soya milk is relatively low carb with unsweetened soya milk having as little as 0.1g of carbohydrate per 100ml and so represents a good option for people with diabetes looking to keep tight control of blood glucose levels. The calorie content of soya milk typically varies between 20 and 40 calories per 100ml. Summary: Opinions on soya milk can vary widely. Because soya milk is generally both low carb and low calorie, it may be worth trying different versions of soya milk to see which works best for you. Almond milk can have a mild sweetness as well as a mild almond flavour, with unsweetened almond being more noticeably nutty. If you’re looking for a low calorie option, almond milk is a great pick. Almond milk typically has between 10 and 25 calories per 100ml, with unsweetened almond at the lower end of this scale. Almond milk tends to have lower carbohydrate content than cow’s milk with unsweetened almond milk having as little 0.1g of carbs per 100ml. Sweetened almond milk may have around 3g of carbohydrate per 100ml. Summary: If you appreciate an almond taste, try the unsweetened variety but if unsweetened is too nutty, sweeter varieties may still be low carb and low calorie. Rice milk is quite sweet tasting and watery, like a sweeter version of skimmed milk. The sweetness of rice milk means it is not the best choice of milk alternatives for people with diabetes. Rice milk can have up to 10g of carbohydrate and around 50 calories per 100ml. Summary: Rice milk may work well if sweetness is specifically required, but for every day usage, look to other options. When we think about coconut, many of us may picture the watery fluid that comes out of a fresh coconut when split open, however, coconut milk is made from the white flesh of coconut in a process that involves pulverising the flesh and boiling it with water. Coconut milk has a relatively sweet taste similar to cow’s milk and only a faint taste of coconut. Coconut milk is low carb and low calorie with around 2g of carbohydrate and 30 calories per 100ml. Summary: Coconut milk is another good low carb and low calorie option. Be aware that coconut milk for drinking is available in cartons whereas coconut milk for cooking purposes comes in cans. The taste of hemp milk can vary quite widely and may either be a good match for cow’s milk or may include a nutty or sour taste. Hemp milk can sometimes have a thick or chalky texture. Hemp milk is relatively low carb and low calorie having around 3g of carbs and 40 calories per 100ml. Summary: Hemp milk can be a bit of hit and miss but is worth a try if you’re feeling adventurous or if other milks have not hit the right notes. Oat milk can vary from being creamy to being watery and it’s a good idea to shake the milk before use. Oat milk can taste a little like watery porridge, which won’t come as too big a surprise. Oat milk can have more calories than some of the other milk alternatives but still only at a level comparable with skimmed milk. Oat milk is a little more sweet than cow’s milk, having around 6g of carbs per 100ml, however it is low in fat. Summary: Oat milk may be a good milk alternative if you’re looking for a creamier texture and can tolerate milk with a slightly higher level of carbohydrate.